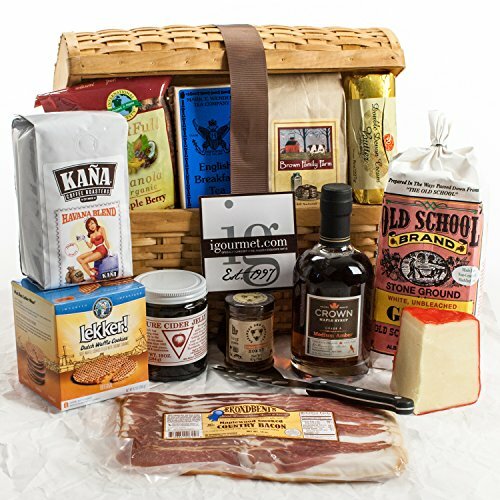 The Gourmet Gift Chest Includes Organic New York Maple Syrup by Crown Maple Farm (12 oz), Eco Cafe Gold Mountain Special Reserve Ground Coffee (12 oz), Organic Hunza Triple Berry Granola (12 oz), Black Tea - 25 Bags (1.76 oz), Vermont Pancake Mix by Brown Family Farm (24 oz), Grafton Classic Reserve Cheddar Cheese (approx. 8 oz), Old School Stone Ground Grits (32 oz), Double Devon Cream Butter (8 oz), Cider Jelly (10 oz), Stroopies Dutch Waffle Cookies (12 oz), Orange Blossom Honey by Savannah Bee Co. (3 oz), Broadbent's Kentucky Bacon (14 oz), and Cheese Knife The KaBloom Gift Basket Collection consists of a variety of gourmet gift baskets including cheese gift baskets, chocolate gift baskets, charcuterie gift baskets and More! Includes: Organic Maple Syrup, Eco Café Ground Coffee, Kentucky Bacon, Organic Berry Granola, Black Tea, Vermont Pancake Mix, Reserve Cheddar Cheese, Grits, Cider Jelly, Dutch Waffle Cookies & More!